We are open from 12:00 to 15:00 and from 18:00 to 23:30 as Restaurant and Pizzeria. In the period between Easter time and the end of September we are open every day. The rest of the year we are closed on Wednesday. For who uses the navigator to reach us, the address is Lungolago Guglielmo Marconi Street 1, 25049 Iseo (BS). In front of the restaurant there is a wide public car park. 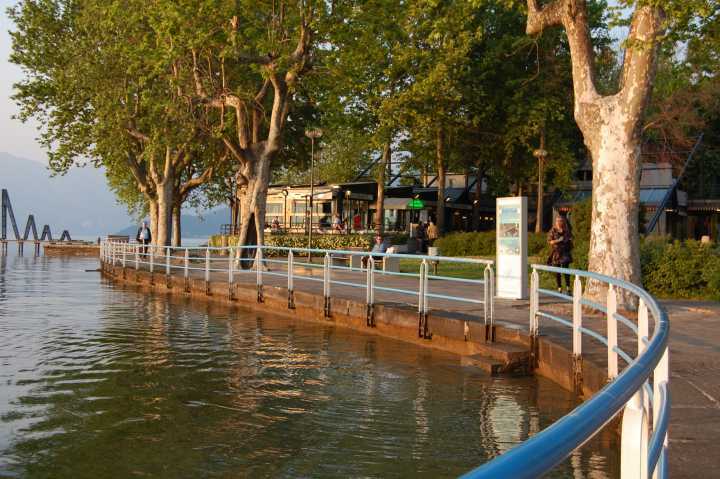 Our restaurant is surrounded by plane-trees and is at the beginning of the lake front road of Iseo, easy recognizable also thanks to the monument in the shape of a wave in the lake. Near us there are the Giardini Garibaldi with the playground area and the Hospital.